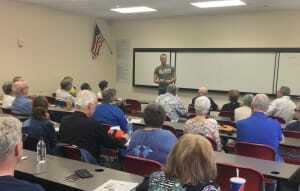 Recently our Chief Instructor Derrek Hofrichter taught a class at the Osher Lifelong Learning Institute at Arizona State University! This is the 3rd semester in a row that Derrek has been included on the semester class schedule, and his classes fill up fast and include a wait list. His classroom discussion included topics of the principles of Krav Maga and how those principles can help you defend yourself at any age. The group had many questions and concerns related to their safety. EVKM Instructor Michele attended as well and demonstrated Krav Maga defenses for various scenarios. Derrek is currently booked for the summer and fall schedules at the Downtown Phoenix campus, so if you are interested in attending a future classroom discussion visit Arizona State University online and register!